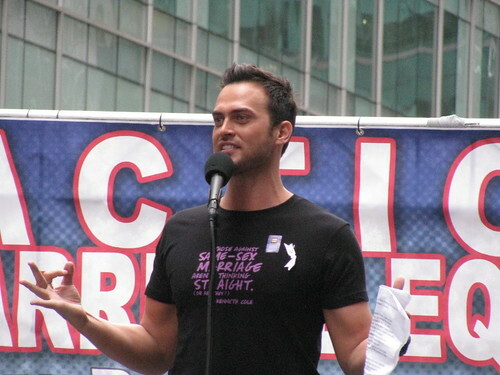 Cheyenne Jackson is an American actor, singer, and songwriter. Cheyenne is the son of Sherri (Kemper) and David Robert Jackson. He was named by his father after the 1950s western series Cheyenne. A picture of Cheyenne’s father can be seen here. A picture of Cheyenne with his father can be seen here. Cheyenne is married to actor Jason Landau, with whom he has two children. Cheyenne has referenced having Native American ancestry on several other occasions. It is not clear if this Native American ancestry has been verified/documented. Cheyenne’s recent paternal ancestors are listed as “White” on United States censuses. Cheyenne’s father took on the surname of his own stepfather, Robert Joseph Jackson. Cheyenne’s paternal grandfather was George Russell McGillen, Jr. (the son of George Russell McGillen and Effie May York). Cheyenne’s grandfather George was born in Montana. Cheyenne’s great-grandfather George was the son of Freeman Erastus Derby and Sarah Elizabeth Barnes; George took the surname of his own stepfather, Andrew W./N. McGillen. Effie was the daughter of George Enos/Washington York and Nancy/Nannie Irene Dabney. Cheyenne’s paternal grandmother was Dolores Veda Barnett/Barnette (the daughter of John Rex Barnett/Barnette and Rebecca Shirer). Dolores was born in Pennsylvania. John was born in Pennsylvania, to English parents, Dennis Barnett and Mary E. Snyder. I can’t find Jackson’s father’s Native American ancestry. Can anyone find anything I might’ve missed? Can you find more about Mackenzie Rosman? I filled out more of her ancestry.